A Palm Beach Police car sits in front of a gate of the Mar-a-Lago Resort in November. 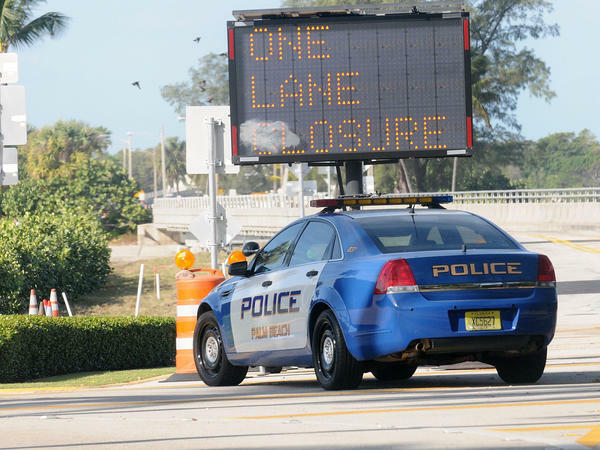 During President Trump's frequent visits, the Secret Service shuts down a major thoroughfare, making it difficult to get anywhere in Palm Beach. Jorge Gonzalez, whose planes tow advertising banners, says the flight restrictions in place while President Trump is at Mar-a-Lago may put him out of business. For the third week in a row, President Trump is spending the weekend in Florida at Mar-a-Lago. It seems Trump enjoys spending time at the club he owns in Palm Beach, but since the election, his stays there have raised issues not seen when he was a private citizen. They involve security and the impact his visits are having on people and businesses in Palm Beach. At Palm Beach County Park Airport in Lantana, just 6 miles from Mar-a-Lago, the situation is dire. For the fifth weekend since December, the airport has shut down. Whenever Trump is in Mar-a-Lago, Federal Aviation Administration restrictions ban all flights out of the airport. The weekend restrictions are especially a problem for Jorge Gonzalez. 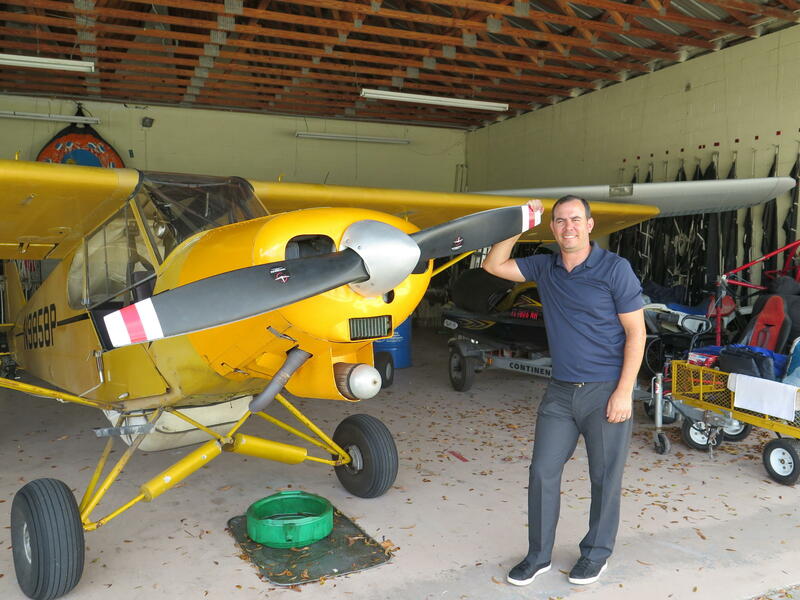 His company, SkyWords, owns four planes that tow advertising banners targeting beachgoers in Palm Beach County. "For our banner towing, 97 percent of our business is done on Saturdays and Sundays and on holidays," Gonzalez says. Recently, he says, Trump "comes every weekend, so basically we aren't able to work." It's a similar story for nearly every business at Lantana, one of the busiest small airports in the country. Flight schools, sightseeing flights and the company that operates the airport say if Trump's visits and the current restrictions continue, they may lose millions of dollars this year. Gonzalez has been talking to county officials, the Secret Service and his member of Congress about finding a way to allow his planes in the air while Trump is at Mar-a-Lago. So far, he hasn't seen success. The problem is that this is the peak season, when snowbirds flock to Florida beaches. Gonzalez says that for his business, time is running out. "Probably another month," he says. "Two months at most. So every week that they drag their feet puts me closer and closer to closing my doors." When Trump was a private citizen, his visits to Mar-a-Lago drew little notice. Palm Beach is used to accommodating the wealthy and famous. But protecting the president demands a level of security that has proved costly for residents, businesses and local government. Along with losing money at its airports, Palm Beach County is also worried about the police overtime it's racking up while Trump is here: $1.5 million so far. The heartburn is greatest in Palm Beach, a manicured enclave where residents enjoy luxury resort living and privacy. At a meeting this week, residents asked the town council to block plans for a presidential helipad at Mar-a-Lago. Jose Flores said the noise and downdraft of the massive Marine helicopters would be a major inconvenience for people who live near the club. "This is a flying tank," Flores said. "If you're having three to five flying tanks going over you, it's going to stop your enjoyment of your property, of your environment, of this town." It's not that Palm Beachers aren't proud that the president likes to spend time on the island. Some just worry he will come every weekend. When Trump is there, the Secret Service shuts down a major thoroughfare, making it difficult to get anywhere in Palm Beach. In the town's tony shopping district, sales are down. Marley Herring, the president of the merchants association, recently asked members of the town council for help. "As you know, the season's very short for us," she said. "We have great concern regarding how the small businesses, my own included, will survive over the next four or maybe eight years." The people who may be happiest about Trump's visits to Mar-a-Lago are the club members. During recent visits, members rubbed shoulders with the president and his entourage. Last weekend, one took photos, later posted on social media, while Trump and Japanese Prime Minister Shinzo Abe appeared to be getting a briefing on North Korea's missile test. Democrats in Congress are asking the Government Accountability Office to review whether the president followed proper security protocols at the club. They also want an account of how much Trump's Mar-a-Lago visits are costing taxpayers. Rep. Lois Frankel, a Democrat who represents Palm Beach, says Trump needs to rethink how he uses the club. "The dining patio is quite lovely, but it's also quite open," Frankel says. "It is not an appropriate place to discuss sensitive matters to national security in the earshot of patrons or waiters." The White House said later Trump had been briefed earlier in a secure location and he and Abe were just discussing logistics for a press event. Frankel says while the president is always welcome anywhere he goes in the U.S., she has a respectful suggestion. "The White House might want to consider having the president bring the excitement of his position to other parts of the country where they would love to see and interact with the president and where he would be also very welcome," she says. But as a member of the town council reminded residents recently, Trump has lived in Palm Beach for more than two decades, and he'll be coming home to rest whether they like it or not. President Trump is scheduled to fly to Mar-a-Lago again tomorrow. It is the third weekend in a row. Trump has always been a frequent visitor to his club in Palm Beach, Fla., but things change once you're elected the president. NPR's Greg Allen reports on the impact Trump's weekend jaunts now have on Palm Beach's people and businesses. GREG ALLEN, BYLINE: At Palm Beach County Park Airport, helicopter flight training is only being done on weekdays, Monday through Thursday. That's because for the fifth weekend since December, the airport just six miles from Mar-a-Lago is shut down. That's especially a problem for Jorge Gonzalez whose planes tow banners that carry ads targeting beachgoers in Palm Beach County. JORGE GONZALES: Ninety-seven percent of our business is done on Saturdays and Sundays and on holidays. He is - comes every weekend, so basically we aren't able to work because that's when we fly. ALLEN: It's a similar story for nearly every business here - flight schools, sightseeing flights and the company that operates the airport. If Trump's visits and the current restrictions continue, the businesses here say they may lose millions this year. Gonzalez has been talking to county officials, the Secret Service and his member of Congress about finding a way to allow his planes in the air while Trump is at Mar-a-Lago, so far, without success. The problem is this is the peak season for Florida beaches. And for his business, time is running out. GONZALES: Another month, two months at most. So every week that they drag their feet puts me closer and closer to closing my doors. ALLEN: When he was a private citizen, Trump's visits drew little notice. Palm Beach is used to accommodating the wealthy and famous, but protecting the president demands a level security that's proved costly for residents, businesses and local government. The heartburn is greatest in Palm Beach where residents enjoy luxury resort living and their privacy. When Trump is here, the Secret Service shuts down a major thoroughfare making it difficult to get anywhere in Palm Beach. In the town's tony shopping district, sales are down. President of the merchants association, Marley Herring, recently asked members of the town council for help. MARLEY HERRING: The season is very short for us. We have great concern regarding how the small businesses, my own included, will survive over the next four or maybe eight years. ALLEN: The people who may be happiest about Trump's visits to Mar-a-Lago are the club members. During recent visits, members rub shoulders with the president and his entourage. Last weekend, one took photos later posted on social media while Trump and Japanese Prime Minister Shinzo Abe appeared to be getting a briefing on North Korea's missile test. Congresswoman Lois Frankel, who represents Palm Beach, says Trump needs to rethink how he uses the club. LOIS FRANKEL: The dining patio is quite lovely, but it's also quite open. It is not an appropriate place to discuss sensitive matters to national security in the earshot of patrons or waiters. ALLEN: The White House said later, Trump had been briefed earlier in a secure location, and he and Abe were just discussing logistics for a press event. Frankel says while the president is always welcomed anywhere he goes in the U.S., she has a respectful suggestion. FRANKEL: The White House might want to consider having the president bring the excitement of his position to other parts of the country. ALLEN: But as a member of the town council reminded residents recently, Trump has lived in Palm Beach for more than two decades, and he'll be coming home to rest whether they like it or not. Greg Allen, NPR News, Miami. (SOUNDBITE OF YPPAH SONG, "GUMBALL MACHINE WEEKEND") Transcript provided by NPR, Copyright NPR.